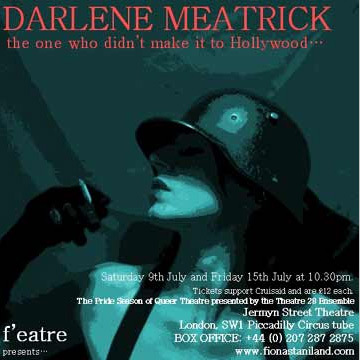 f'eatre have created their second show Darlene Meatrick: the one who didn't get to Hollywood, which will showcase during Gay Pride on Saturday 9th July and Friday 15th July at 10.30pm. Tickets support Cruisaid and are �12 each. It's strongly advisable to book soon! Many German artists left Germany during the Nazi regime, but many stayedlike Darlene. Was it for love of her beloved city? Or to protect her friends and family in the Cabaret clubs? Did she not see the end coming? What exactly did she do to survive and was she perhaps momentarily seduced by the dark side? Whatever the reason, Darlene Meatrick took the wrong turn at the cross road. Most of the Cabaret scene players would have ended up in concentration camps. The show is a celebration of sexual freedom of the men and women of the Berlin Cabaret scene. It is also an ode to the tragedy of Germany and Europe. And it is an examination of the vanities and hypocrisy of man. Darlene didn't get out in time... instead of Hollywood she decided to stay with her friends in Berlin and face the music... but what music it was!